are a one time decorative stencil masking patterns. for sample border stencil sets. and faux finishers looking to enhance their sample boards. Everything you need for your craft! Find professional construction contracts, books and software at ContractorCity.com Contractor Forms, Construction Books, Software and Resources for Building Pros. Construction contracts, cost estimators, building codes, license exam guides, permits, bidding, forums and more. Distributing and stocking a full range of faux finishing coatings, Tools and Accessories and Private Label Division. Greco Coatings also offers full training programs and certified curriculums to teach both the art and businesses of decorative art in the Faux industry. Wood Icing is a simple three-part process that can be applied to wood, metal, and plastic. Visit this online store for all your needs relating to this inovative faux finishing product. Canadian based faux finishing manufacturer/distributor of decorative faux finishing products. Importer of Adicolor Srl. Italian plaster and glazes. 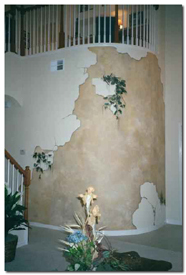 Perfetto, Inc. provides Faux Finish training as well as manufactures a large line of water based faux finish products. SkimStone Hybidized Portland Cement is a unique new decorative finishing system developed for both the DIY and Professional. Pro Faux is your online resource for professional faux finishing and includes advice, techniques, workshops, specialty brushes and tools. Learn to build concrete countertops for your kitchen and other parts of your home or business..